A warm and melodious 14-piece collection comprised of music for choirs, assemblies and instrumentalists. 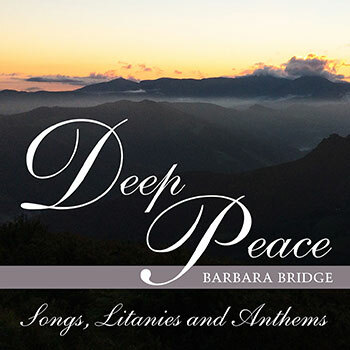 Barbara Bridge offers Deep Peace, 14 lovely pieces composed for SATB choir and assembly, with keyboard and guitar accompaniments. Many songs include Taizé-inspired chant, creating meditative atmospheres that promote personal prayer and reflection, and the lyrical repetition allows for introspection. It is a collection that draws us closer to our God through its comfort, warmth and inviting melodies. These pieces span a 20-year journey, during which time Barbara worked at OCP as part of the Music Development Team. It is her experience as a choir director, cantor and presenter, and her dedication to faith formation that allow her to create such unique, powerful music for liturgy, prayer and devotion. “Deep Peace” is an uplifting text that transcends religious identity. Newly arranged for piano and SATB choir, this piece features an intentionally simple melody suitable for most choirs. With a chant-like melody, “As a Mother Cares” uses the analogy of a mother’s love for her child to demonstrate the immense mercy of God. And “Veni, Creator Spiritus” is built around an ostinato, invoking the Holy Spirit to come among us. The lyrical simplicity of this piece adds to its intensity and power, making it a great addition to any choir’s repertoire. Barbara has also composed three lovely litanies for use during prayer services. Her “Litany for the Earth,” inspired by Pope Francis’ encyclical, Laudato Si’, calls us to recognize God’s spectacular creations and serve as stewards of the earth. “Litany of Peace” is based on the “Prayer of St. Francis of Assisi.” Instantly recognizable in its cry for an end to hatred and anger, this prayer features a clear, understated refrain: “Make me an instrument of your peace.” Lastly, her “Litany of the Saints” offers unique, alternating moments for male and female cantors. This creates a vocal juxtaposition that is met with a metered response from the assembly, as they pray for the intercession of the saints.